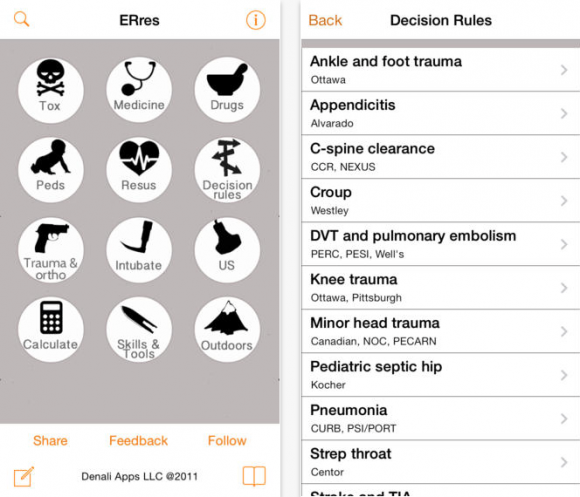 ERres is the swiss army knife of apps for Emergency Medicine providers. ERres is essential for all physicians who work in the ER setting due to the breadth of content contained. It can be used at the point of care for a wide acuity of conditions. If there is one app you’re going to download from this list, ERres is going to be the most useful. The only reason it wasn’t the number one app was due to the significant amount of content contained in PressorDex. Thanks for supporting the PressorDex app Iltifat. We’re all really proud of the product and hope it’s helped improve the care provided to the critically ill patients in our EDs. Stay tuned as we are in the midst of updating the app – should be out by the end of the year! Thanks for mentioning this! we will update the portion on WikiEm — keep up the good work!! There is no mention in the EyeMD app regarding how far away the iPhone should be from the patient in order to use Snellen chart accurately. Do you know? So a lot of this is a function of your phone size. Unfortunate with various phone sizes it starts to get a bit complicated. In general, usually 4 to 6 feet is what other eye chart apps will state. I would suggest asking your hospital ophthalmologist for a definitive answer.